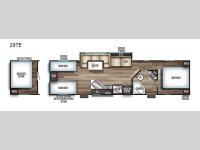 Your larger family will love spending weekends away with this Cherokee Grey Wolf travel trailer as their home away from home. This model offers sleeping for ten comfortably depending on the bedroom choice you make. The standard set up features four bunk beds in the rear private bunkhouse, or you can select a queen bed in place of the bunks. In the front, there is a private bedroom with wardrobes and nightstands on either side of the queen bed, and it even has access to the dual-entry bath. The two entry doors will make accessing the trailer easy for everyone, and you will appreciate the abundant storage throughout this unit including large overhead cabinets, a walk-in pantry, plus numerous outside storage compartments for all of your outdoor gear. You even have the option to add an outdoor kitchen! 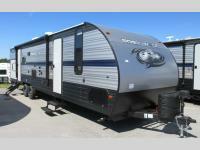 All Forest River Cherokee Grey Wolf models are quality built with distinct features and superior comfort in mind, and they are all set at an affordable price point. 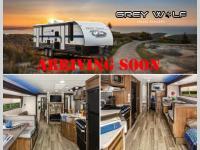 So, when you get the opportunity to escape the hustle and bustle of everyday life to enjoy all the beauty and wonder that an outdoor adventure holds, the Cherokee Grey Wolf is ready and waiting to help you relax and unwind. Each unit features an outdoor shower with hot and cold water for you to get cleaned up without tracking mud throughout after your adventurous hike, and with the RVQ quick connect, you can easily hook up a low-pressure grill to cook up your best burgers outdoors. Inside, you will enjoy the HDMI entertainment center, the LED lighting throughout, and a kitchen skylight with a shade, and if you get tired of being indoors during inclement weather, the outdoor power awning will provide protection.